The CS-520 wireless headset system combines the clarity of traditional wired technology with the mobility of wireless, so employees can move around to wherever business takes them — without interrupting or missing critical communication. Wireless headsets transform the work environment by facilitating active collaboration and joint problem solving, increasing employee availability, and enhancing the ability to multi-task. The CS-520 is a dual earpiece headset, ideal for Nurses, Doctors, Lab Technicians, and anyone needing to be mobile and still in full duplex verbal communication. It’s also perfect for anyone working in a high noise environment, as well as those in need of privacy from other nearby conversations. 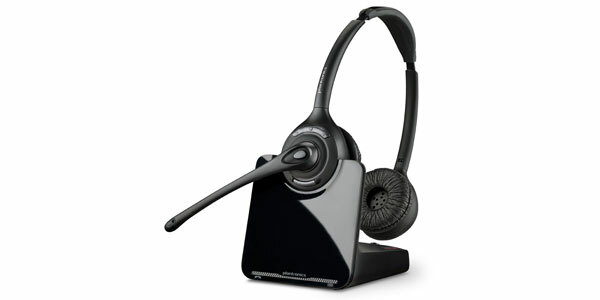 The Tech Works CS-520 wireless headset comes complete with its own power supply and charging base/receiver unit. The receiver unit also connects with and charges your other Tech Works products. A custom 7 foot headset line cord is included with the 520 to allow easy access to the base unit for charging, while mounting the other equipment out of the way to save valuable desk or counter space. When used with other Tech Works products such as the new Collaborative Intercom CI-HSI-41 headset combine system or the CI-ODC-1 Operator Desk Console, no other products are required. A system can be made by simply plugging the required number of CS-520s into the CI-HSI-41. Range: Up to 300 ft.